Department Planning Profiles provide summary information for every division and department – both academic and non-academic units. Data trends are provided since 2011. Links to historical data are provided below. Log into Department Planning Profiles here. 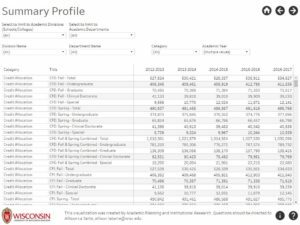 Faculty Roster Counts – FTE by rank and age group. For more detail, visit the Faculty Roster interactive visualization. Expenditures – summary expenditures by expenditure category and program. Research Awards – total research awards, with federal and non-federal disaggregation. Assignments of Academic Programs and Subjects to Departments – see the Academic Structure. Department Planning Profiles is under ongoing development and evolution. Direct questions and feedback on the visualization to Allison La Tarte at allison.latarte@wisc.edu. Access to the files is limited to UW-Madison employees and requires a NetID and password log in. -MS-Excel 2013 format; uses slicers to filter the data for unit or metric of interest. *Credit data for Spring 2016 is not included in the file due to a data inconsistency. Refer to the current version of Department Planning Profiles to obtain this information. Contact us at allison.latarte@wisc.edu if you have trouble with file format or if you would like a previous version. The Department Planning Profiles were originally developed in 1984 by the College of Letters & Science. In the late 1990s they were expanded to include departments in the other schools and colleges, as a result of a joint project between Academic Planning and Institutional Research, the Madison Budget Office, and the College of Letters and Science. Planning for this all-campus update started in 2013 as a collaboration of APIR, MBO and InfoAccess.